To make jaggery (god in konkani; gur in North India), sugarcane juice is simply boiled in open air vats, condensed and poured in moulds. See my picture post on the Making of Jaggery in Karnataka. Jaggery is not refined and no chemicals are added in its processing, it thus retains much of the fiber, minerals and vitamins. When consumed, it’s sugar is released much slowly in the blood stream compared to refined sugars, thus it is considered a healthier alternative to sugar. Jaggery is commonly available as light to dark brown chunks, with the consistency of fudge and can be eaten as is, just like fudge. 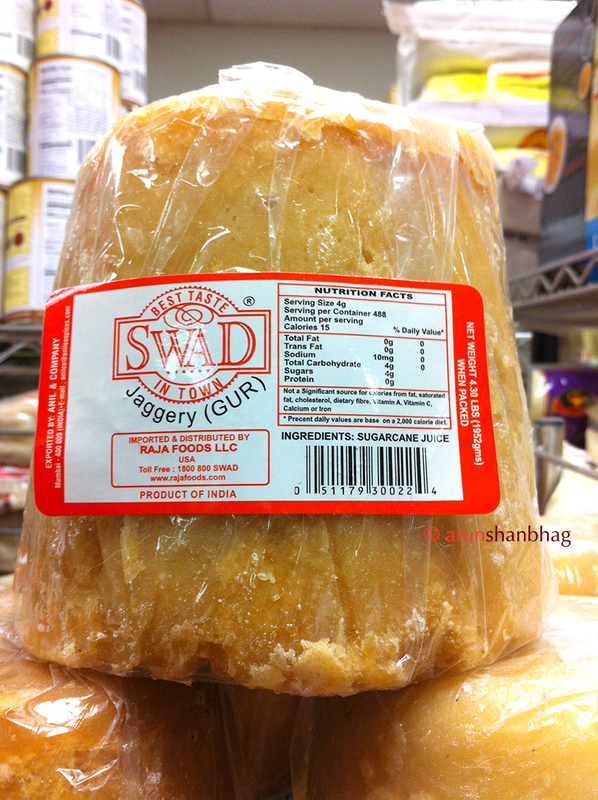 Jaggery is an important ingredient in many indian dishes, as its sweetness balances the spice or sourness of the dish. It is even available in Indian grocery stores here in Boston. 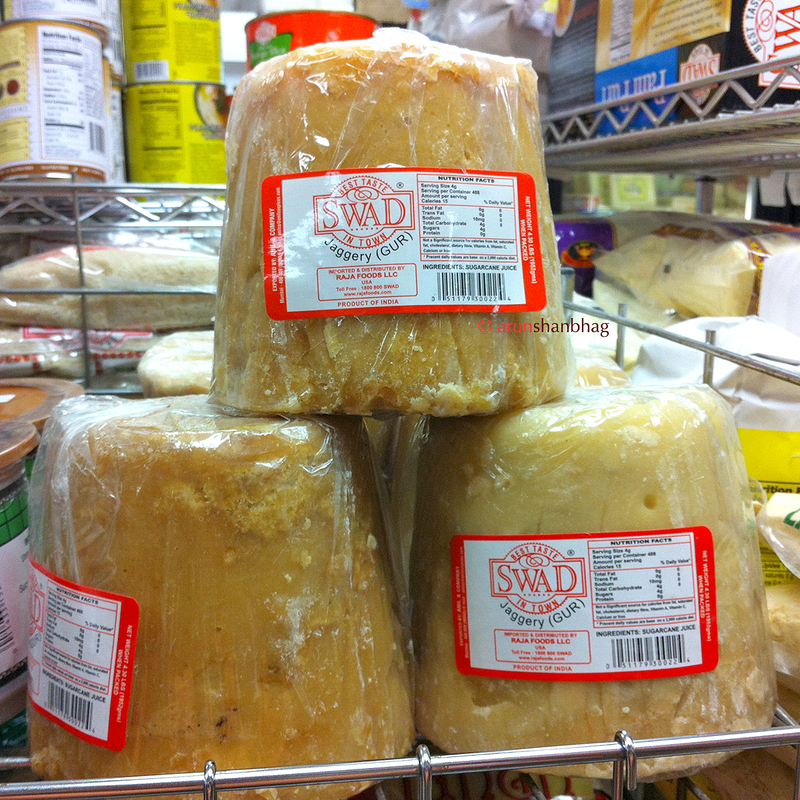 Got his 4 lb block of jaggery ($4.99) in the Spiceland Grocery Store in Burlington, MA. We simply use a knife to pry out smaller blocks which we use in making tambdo phovu, my favorite dill idlis and the konkani delicacy Kadgi Chakko. I also use it in my Kaapi (indian coffee). It is primary base and bonding ingredient in the simple, but yummy Indian candy Chikki. 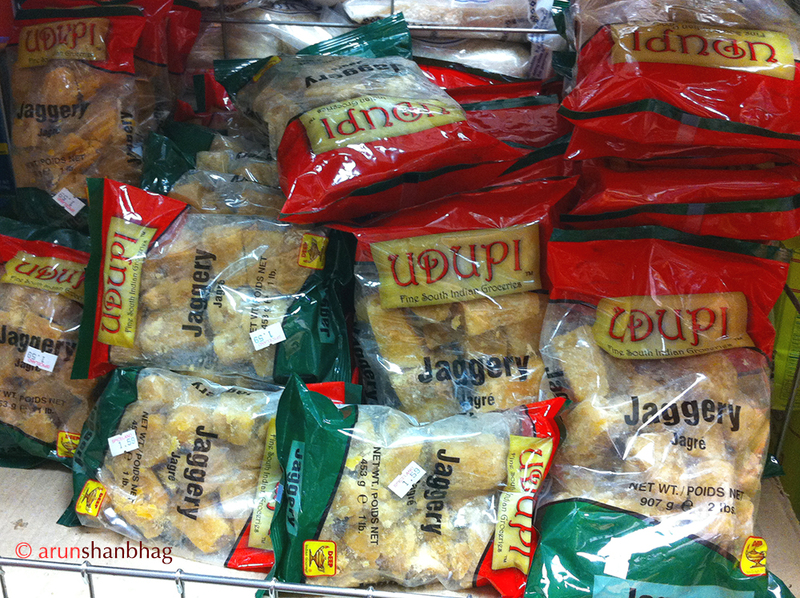 If you don’t want to be bothered with a big lump, you can buy jaggery in smaller blocks as well. Video of making sugarcane juice in Colaba Mumbai. Really nice and informative . Not sure , how i missed this topic – Can i reference your article on Jaggery ( Gaud in konkani 🙂 ) on my blog? Of course, you always can. What made you ask? Enjoyed reading the article which is informative as well as interesting. It was an eye-opener to one with superficial knowledge of gud – inspite of a healthy preference for it in coffee and Amchi delicacies like sukke and amti I clearly recall the gud-making procedure at my Grandfather’s old house, which is described in “Childhood Daze” as seen through the eyes of a child ! Nice post, esp the pics of the godda acchus. Goda also tastes great in ponsa muleeka (I made a batch last week). When we were kids we usually bought roasted peanuts from the pushcart seller and took a bite of goda after shoving a fistful of freshly-shelled peanuts into our mouths. This was a group activity, aunts, uncles, cousins all sitting round a big pile of peanuts. Following up very late on this comment. We have been roasting raw peanuts at home for Meera and she loves it. I additionally throw in a pinch of goda with the peanuts; a truly simple and beautiful pleasure.